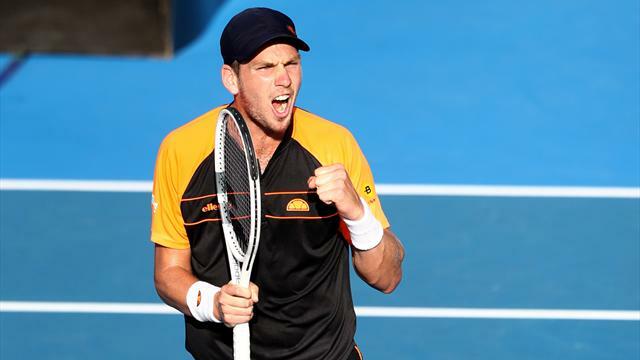 British number two Cameron Norrie reached his first ATP Tour final after beating German Jan-Lennard Struff 7-5 4-6 6-3 at the ASB Classic in Auckland on Friday. Norrie, who grew up in Auckland and represented New Zealand before switching allegiance to Britain in 2013, saved eight of 10 break points he faced in an intense semi-final against Struff, which lasted for nearly two hours. The 23-year-old regrouped after conceding the second set and finished with 17 aces, sealing his place in Saturday's title decider against American Tennys Sandgren. "I was really, really nervous in that last game... slightly tight, but a big thanks to the crowd for getting me through that," said Norrie, who will begin his Australian Open campaign against American Taylor Fritz next week. "It's so special... It's my first final and to do it at home, too, it means so much to me." Sandgren produced a clinical display against German Philipp Kohlschreiber, winning 31 of his 33 first-serve points and saving all three break points to record a 6-4 6-2 victory.